Farm-fresh cuisine, carefully harvested ingredients, and regional recipes inspire the seasonal menus at the Woodstock Inn & Resort’s four distinct restaurants. The talented culinary team prepares savory dishes from scratch, always seasoned with exceptional, homegrown flavor. The chefs work closely with the Master Gardener at the resort's Kelly Way Gardens to pick fresh ingredients for creative entrées and innovative cocktails, resulting in exceptional Northeastern cuisine that showcases the essence of Vermont. The AAA Four Diamond award-winning restaurant, The Red Rooster, captures the essence of Vermont in its delightful satisfying dishes and relaxed setting. 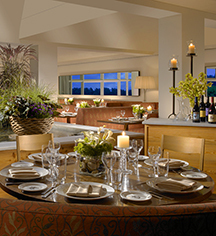 The restaurant showcases menus that draw from the best purveyors in New England, emphasizing fresh, local ingredients – including specialty cheeses, beef, and heirloom fruits and vegetables, all perfectly prepared by the culinary team. The Red Rooster serves breakfast, lunch, dinner, and bar service. Breakfast Buffet: 7:00 a.m. - 10:30 a.m.
Light Fare at Bar: 3:00 p.m. - 6:00 p.m.
Dinner: Sunday through Thursday, 6:00 p.m. - 9:00 p.m. The essence of Vermont and flavor-driven small plates are paired with a bar, featuring local craft brews and spirits, at Richardson’s Tavern. A relaxed atmosphere invites warm conversation and friendly company among friends and family. Dine al fresco on the porch in the warmer months or sink into the oversized lounge chairs fireside for a casual drink or meal. Richardson's Tavern serves dinner and bar service. Dinner: Sunday through Thursday, 5:00 p.m. – 9:00 p.m.
Dinner: Friday and Saturday, 5:00 p.m. – 10:00 p.m. The 19th hole converges at The Fairway Grill, which brings al fresco bistro fare to the golf-side greens of the award-winning Woodstock Country Club. With a birds-eye view of the manicured course, celebrate the day’s triumphs or tribulations with light morsels, savory burgers, and abundant garden salads, picked fresh daily. The Fairway Grill seasonally serves lunch and bar service. Perley Wheeler was the original lodge keeper at Suicide Six. His bushy white beard punctuated by a hand-carved wooden pipe was the familiar sight that greeted guests both on and off the hill. 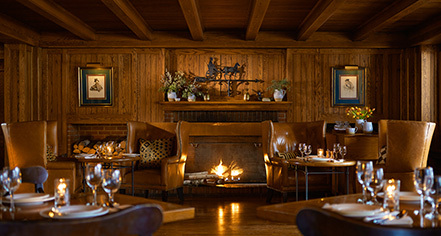 As an homage to Perley, this seated restaurant and lounge offers a variety of selections chosen by the Master Chef to keep the fire stoked, and the newly installed six-tap system will feature local brews to help get guests to the heart of après ski.